KIDS VITAMINS – NO KIDDING! Looking for a high-quality, natural KIDS MULTIVITAMIN? Me, too. Do you look in vitamin stores, natural foods stores, and online marketplaces—in vain? I have. 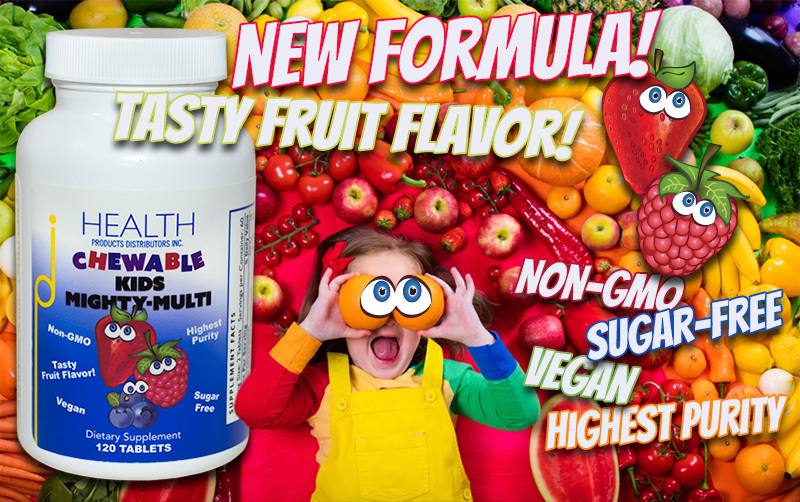 A couple years ago, HPDI’s formulator, my father Hank Liers, PhD decided to reformulate our already excellent kids multivitamin—the Kids Mighty-Multi!—to make it better. His intentions were good: the world’s best designer of adult multivitamins would improve the best children’s vitamin. My quandary? 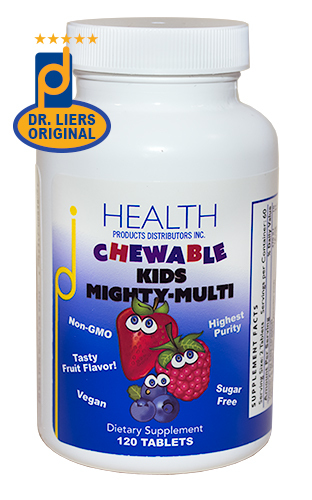 While Dr. Hank was busy at work reformulating our kids multi, the existing—and uber-excellent—original Kids Mighty-Multi! went out-of-stock, and never came back. Suddenly, my seven-year-old son’s “go-to” multivitamin was gone…indefinitely! I took action—kids vitamins became my obsession—because I wanted the best multivitamin for my child. I searched everywhere for high-quality kids vitamins. Leaving no stone unturned, we tried them all—including organic, whole food, gluten-free, vegan-friendly brands with glossy labels. Did we find good ones? Not really. What DID we find? Well, not much—and a lot. That is, not much in the way of high potency, high-purity, or advanced forms, like coenzyme vitamins. And a lot of false promises and junk ingredients. Like sugar and corn syrup and GMO ingredients—even from “reputable” brands. Not to mention artificial sweeteners, colorings, flavorings, as well as toxic preservatives and fillers, which are the de facto standard in conventional products. Natural products are better—not always by as much as you’d expect. Looking for a good children’s multivitamin? 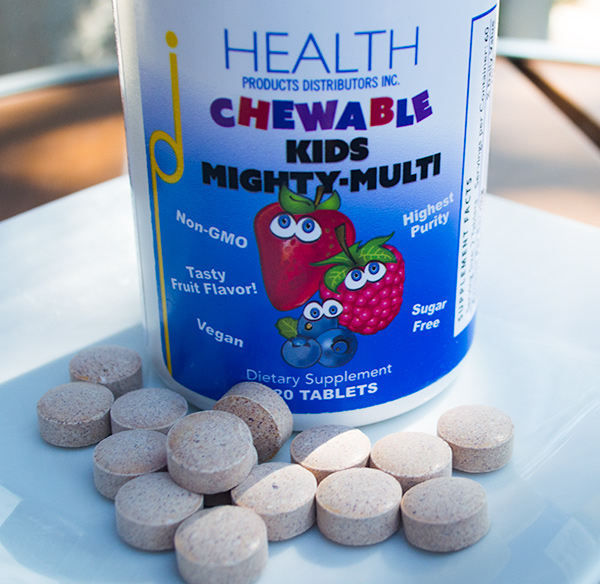 Look no further than chewable Kids Mighty-Multi! Now in label-induced miasmic SHOCK…I proposed a reversal of terms. I simply wanted a lot of good things—like complete, balanced nutrients—and not much in the way of toxic additives. Was I asking *too* much? No way. Yet, I was giving up on finding a suitable kids multivitamin. My son instead began taking an HPDI adult multivitamin (Multi Two Caps) we scaled to his sixty five-pound weight. The taste wasn’t great—so we opened capsules directly into his juices and smoothies—because he’s not ready to swallow capsules or tablets whole. At best…a partial solution. KIDS MIGHTY-MULTI! BACK — BETTER THAN EVER! Then. It. Happened. Lighting struck—HPDI’s Kids Mighty-Multi! is BACK! Turns out my dad finished reformulating the world’s best kids multivitamin. He broke the news with a smile. Stunned and unbelieving…I took a breath. My heart skipped a beat. Then I grabbed a bottle! Who knew it would take two years?—and now, who cares!? This month, HPDI proudly introduces a *new* Kids Mighty Multi!. Worth the wait? Yes. Because the new version is better than ever. I’ve thrown away my wishlist. My search is over. Yours may be, too. Because no kids multivitamin comes *close* to Kids Mighty-Multi!. See the comparison chart and nutrient table (below). A SERIOUS VITAMIN FOR KIDS – FINALLY! What makes the new Kids Mighty-Multi! so good, and so much better? Let me count the ways. Here is a summary of benefits before I dive into discussing them in greater detail. • Kids and adults love the taste! • Full-spectrum of balanced, essential nutrients needed for creating, supporting, and maintaining excellent health for your child. Includes natural coenzyme form vitamins and Krebs’ cycle bionutrients that work with young bodies to provide energy for metabolic processes, healing, and optimal health. • Bioavailable vitamin and mineral carriers the body recognizes and can assimilate rapidly. Plus, multiple carriers of individual nutrients ensure assimilation. Chewable form speeds uptake in the body. • Functional ingredients built into every aspect of the formula, including the taste-enhancing package, herbal ingredients, and cofactors. Functional ingredients serve multiple purposes in supporting health. • Flavored using only healthy, natural sweeteners and taste enhancers, including mannitol, fructooligosaccharides (FOS) (from chicory root), organic beet root powder, natural fruit flavor, xylitol, and stevia leaf extract. Taste enhancers exhibiting additional positive benefits (i.e., prebiotic effects, cavity prevention, and antioxidant action). • NO refined sugars, no corn syrup, and…NO GMOs! 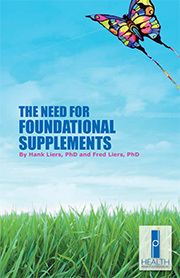 • Foundational formula ideal for providing basic nutrients for health. A high-quality multivitamin is the first step toward a complete nutritional supplement regimen. Formulated to work well with other HPDI foundational formulas, such as vitamin C / antioxidant formulas (like PRO-C™) and essential fatty acids (like Essential Fats plus E). Kids Mighty-Multi! tastes GREAT! Kids and adults LOVE the taste. From the perspective of your child’s taste buds, that’s *all* that matters. But I want to talk a bit about the importance of healthy sweeteners…and how the best sweeteners perform double duty as health promoters. Because Dr. Liers created a natural taste-enhancing complex. This taste-enhancing package includes xylitol, mannitol, FOS (fructooligosaccharides), beet root juice powder, natural fruit flavors, and stevia leaf extract. Dr. Hank selected healthy, functional ingredients—as much as possible—in order to enhance the taste. That means these taste enhancers are not only NOT unhealthy like the refined sugars, corn syrups, and artificial sweeteners I found in so many other kids vitamins. But they are GOOD for you! • Mannitol – Natural polyol sweetener with added benefits as an antioxidant. Mannitol surprisingly has a very powerful effect on the hydroxyl free-radical. (see: https://www.ncbi.nlm.nih.gov/pubmed/9090754). 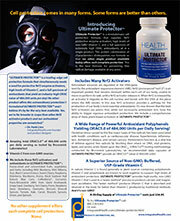 Mannitol serves double duty as a healthy sweetener and important hydroxyl radical free-radical trapper. • Fructooligosaccharides (FOS) (from chicory root) – Naturally sweet with no or low glycemic index. It is also a prebiotic that supports the growth of beneficial bacteria. • Beet Root Powder (organic) – Naturally sweetens and colors Kids Mighty-Multi!. Beet is a functional ingredient providing methyl donors and easily assimilable iron. Moreover, Dr. Benjamin S. Frank found beets contain an amino acid the body uses to create its own dietary nucleic acids and a nutrient important to brain function (No-Aging Diet, 81). • Berry & Fruit Extracts / Flavors – Mixed berry, strawberry, raspberry, and pomegranate. 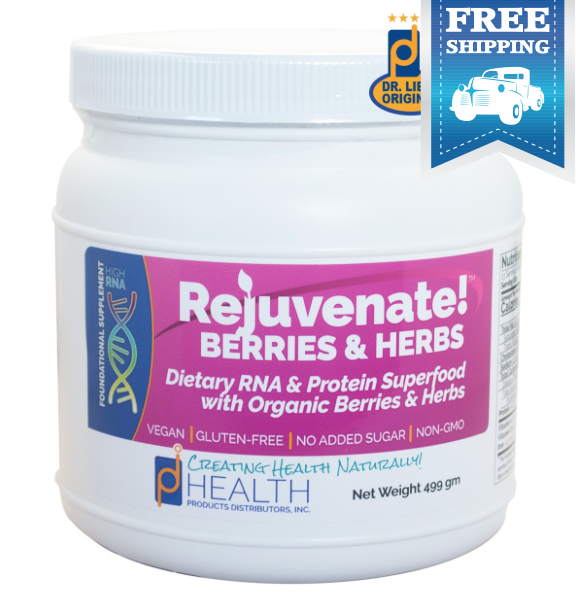 These berry extracts provide extremely good, fruity taste—bursting with berry flavors! Why is choosing “good-for-you” functional sweeteners and taste enhancers important? Because despite what adults might wish, sweeteners still comprise the largest percentage of kids multivitamins by weight. That means your child will be ingesting significant amounts (of whatever these sweeteners are) relative to the size of their multivitamin. Who wants the bulk of their child’s multivitamin intake comprised of sugars, corn syrup, sucralose, or worse (think aspartame)? This is the reason natural sweeteners providing functional benefits make all the difference for health. COMPLETENESS MATTERS – A LOT! Kids Mighty-Multi! is nothing if not complete. As formulated by Dr. Hank Liers, it provides therapeutic levels of all essential vitamins, minerals, cofactors, and much more. Missing important nutrients is bad for consumers—like you and your child—because all nutrients require other nutrients to “do a body good.” It’s called synergy, and it’s the way our cells are designed to work. That means if you obtain sufficient amounts of a specific nutrient, but not enough of another, you may be unable to effectively utilize the nutrient you have—because utilization requires the nutrient you *don’t* have. Catch-22, huh? I’ll talk more about this later. 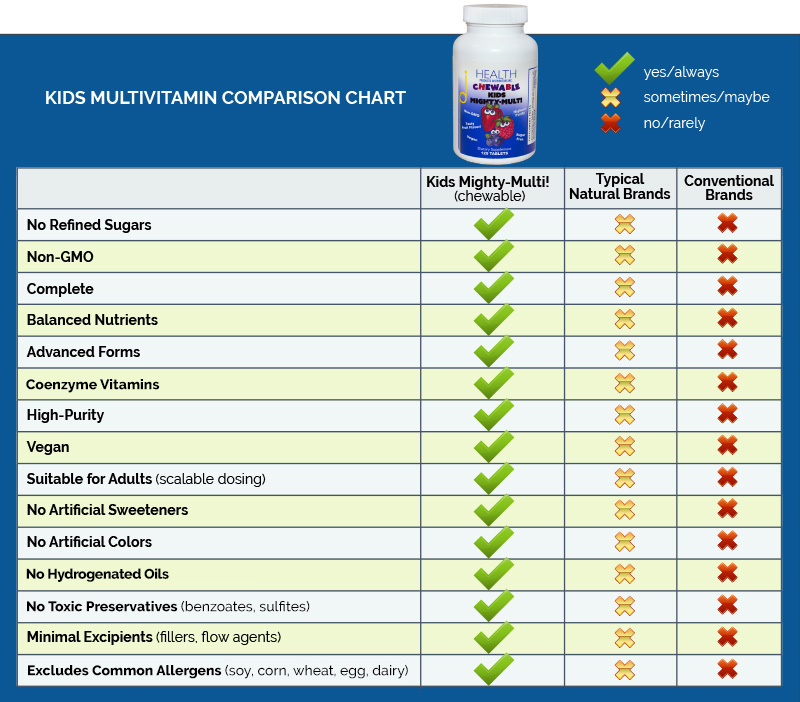 Do your child—and yourself—a favor: choose a complete multivitamin like Kids Mighty-Multi!. Then, there are advanced forms of nutrients, like coenzyme B vitamins. Most kids vitamins (and adult multivitamins) offer you the B complex vitamins as synthetic forms. How can you tell? Well, coenzyme vitamin B1 in Kids Mighty-Multi! 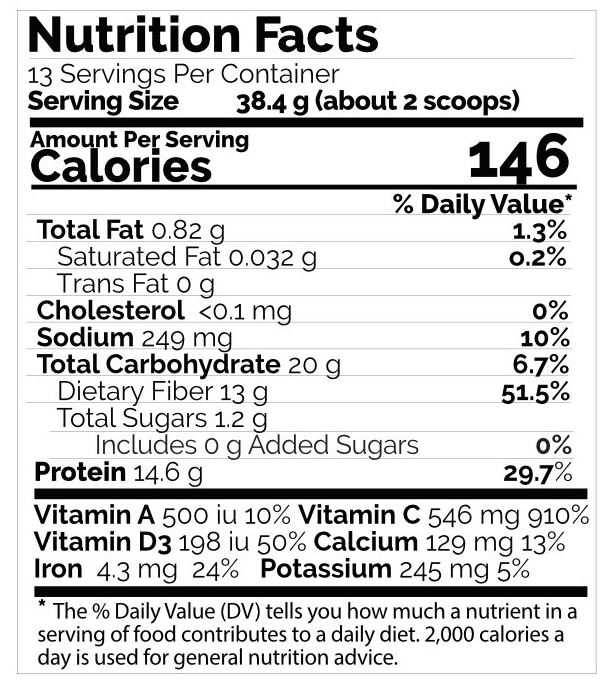 is from Thiamin Diphosphate and is very different from synthetic “thiamine HCl.” Vitamin B2 is from Riboflavin-5′-Phosphate is not synthetic “riboflavin.” The vitamin B6 is from Pyridoxal-5′-Phosphate is not “pyridoxine HCl.” And so on. What about vitamin B12 as toxic “cyanocobalamin”? Never. Kids Mighty-Multi! provides coenzyme B12 as methylcobalamin. Other brands sometimes use this form, but then provide synthetic forms for other B vitamins. That makes sense—NOT. Sure, coenzyme B vitamins cost more to source. But the truth is, your body requires far less coenzyme form vitamins because they are the natural forms found in foods—you easily assimilate and utilize them. Kids Mighty-Multi! doesn’t need large amounts of coenzyme vitamins to give you big benefits. Meanwhile, synthetic forms are not as easily assimilated—most go through a complex enzymatic breakdown before the body can use them. In some cases (for example if your child lacks certain enzymes due to genetics), syntethic forms cannot be broken down—or used—at all! Case in point: Folate. Most kids vitamins give you “folic acid,” which is synthetic vitamin B1. A large percentage of the population (including me) lacks the gene providing the enzyme required to process folic acid. If folic acid builds up in cells (because it can’t be broken down), then it can be toxic. Solution: we use coenzyme folate—or 5-MTHF (5-methyl tetrahydrofolate) in Kids Mighty-Multi!. Problem solved. Recall I said Kids Mighty-Multi! is complete?—and the importance of completeness in a multivitamin? Well, for example, if your kids’ multivitamin only provides synthetic vitamin B6 (as Pyridoxine HCl), it won’t be convertable into its biologically active (coenzyme) form without coenzyme vitamin B1 (Riboflavin-5′-Phosphate). Did you catch that? To convert Pyridoxine HCl (synthetic vitamin B6) to its usable coenzyme form Pyridoxal-5′-Phosphate, you need coenzyme Riboflavin (Riboflavin-5′-Phosphate). You need a coenzyme form of one B vitamin in order to convert another B vitamin to its coenzyme form! If you have only synthetic forms of these B vitamins, your body must go through multiple conversion processes in order to first convert synthetic Riboflavin into coenzyme Riboflavin so that you can convert synthetic vitamin B6 (Pyridoxine HCl) into its coenzyme B6 form (Pyridoxal-5′-Phosphate). Yes, you can *survive* on synthetic forms of B vitamins. But why make your body work so hard? Why survive when you can *thrive* (with coenzyme vitamins)? Why other kids vitamins don’t include coenzyme forms is BEYOND ME. If other brands go with conventional (and sometimes toxic) synthetic forms, so be it. Run, and go with Kids Mighty-Multi!. Other advanced forms include vitamin D as D3 (cholecalciferol), vitamin K as K1 and K2 (Menaquinone-7), and minerals using Krebs’ cycle carriers (like citrates, malates, fumarates, succinates, and aspartates) that are best recognized and utilized in the body because they plug into the body’s energy (ATP) production system. 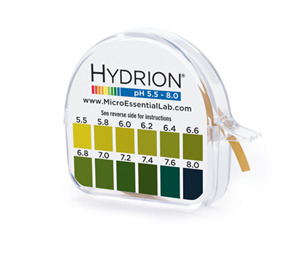 SCALABLE DOSING – CALLING ALL KIDS – AND ADULTS! Maybe the best feature of Kids Mighty-Multi! is scalable dosing. Scalability makes it suitable for children and youth of all sizes—and adults, too! Glancing at Kids Mighty-Multi!‘s label, you might assume it’s as low potency as the most kids’ vitamins available in stores. Not so fast. Because Dr. Hank designed this multivitamin for everyone, including adults. How do I know? Because he told me: he takes these chewables himself! How does it work? You simply take two (2) tablets per 20 pounds of body weight—up to six tablets—for kids. But since most older kids and adults weigh more than 60 pounds, you can take 8–10+ tablets and approximate the nutrition you would get from your regular adult vitamin. How cool is that! Scalable dosing works well for people who don’t like swallowing capsules or tablets, or who prefer a good-tasting chewable. And who doesn’t, sometimes? It is especially useful for traveling because the entire family can use it. In my case, I usually take four capsules per day of Hank & Brian’s Mighty Multi-Vite! , which my favorite adult multivitamin, and the inspiration for creating the Kids Mighty-Multi!. Yet, there are many days when I thrill to the taste of the new chewable kids multivitamin—knowing I get a significant amount of nutritional value. That means a lot. A lot of goodness. And not much to worry about. Dr. Hank Liers pulled out the stops in formulating Kids Mighty-Multi! You’ve got choices. You can go online or to your local natural market, pharmacy, or big box store and fill up on whatever kids vitamins you find. Take your chances. Or you can try Kids Mighty-Multi! to discover how good a children’s multivitamin can (and should) be—a truly superior formula. Choose our awesome kids multivitamin. Dr. Hank did his job. We’re 110% confident it meets—or exceeds—the needs and expectations of your child, and likely you, too. And definitely those of your clients, if you’re a health professional. Of course, you’ve got a brain. But this choice is a “no-brainer.” Go for Kids Mighty Multi!. Your kids will never go back to their old multivitamin. And they’ll be healthier for it. “Oxygen free radical scavenging abilities of vitamins C and E, and a grape seed proanthocyanidin extract in vitro.” Res Commun Mol Pathol Pharmacol. 95(2):179-89. Ultimate Protector contains curcuminoids (greater than 95% from turmeric), as well as components from 29 different fruits, vegetables, and herbs. Each of these ingredients contain substances that may be considered to be polyphenols, antioxidants, and Nrf2 activators. In this article I will explore the ingredient curcuminoids, which is added as a separate ingredient. Curcuminoids are the major active component of turmeric, a yellow compound isolated from the plant Curcuma longa (a member of the ginger family) and has been used for centuries in traditional medicines. Curcuminoids in turmeric include curcumin, desmethoxycurcumin, and bisdesmethoxycurcumin (these are standardized in the Sabinsa Curcumin C3 Complex® ingredient). Extensive research over the past 30 years indicates that these molecules can provide positive benefits against a wide range of health issues related to cell function, lungs, liver, nervous system, joint function, metabolism, and cardiovascular system. Numerous lines of evidence indicate that curcuminoids are highly pleiotropic with anti-inflammatory, hypoglycemic, antioxidant, wound healing, and antimicrobial activities. Curcuminoids exert both direct and indirect antioxidant effects by scavenging reactive oxygen species (ROS) and inducing the expression of cytoprotective proteins in an Nrf2-dependent way. It is considered a bifunctional antioxidant. The nuclear-factor-erythroid-2-related factor 2 (Nrf2), is a ubiquitous master transcription factor which induces the endogenous production of cytoprotective proteins/enzymes through binding to antioxidant response elements (AREs) at the DNA/gene level. Databases (like the PubMed database of the National Institutes of Health (NIH)) of scientific studies contain thousands of up-to-date studies and abstracts about curcumin/curcuminoids. Below we provide a few relevant scientific studies on the antioxidant effects and potential health benefits of curcumin/curcuminoids. Curcumin (diferuloylmethane), a yellow pigment in the spice turmeric (also called curry powder), has been used for centuries as a treatment for inflammatory diseases. Extensive research within the past two decades has shown that curcumin mediates its anti-inflammatory effects through the downregulation of inflammatory transcription factors (such as nuclear factor kappaB), enzymes (such as cyclooxygenase 2 and 5 lipoxygenase) and cytokines (such as tumor necrosis factor, interleukin 1 and interleukin 6). Because of the crucial role of inflammation in most chronic diseases, the potential of curcumin has been examined in neoplastic, neurological, cardiovascular, pulmonary and metabolic diseases. The pharmacodynamics and pharmacokinetics of curcumin have been examined in animals and in humans. Various pharmacological aspects of curcumin in vitro and in vivo are discussed in detail here. Curcumin, a yellow pigment from Curcuma longa, is a major component of turmeric and is commonly used as a spice and food-coloring agent. It is also used as a cosmetic and in some medical preparations. The desirable preventive or putative therapeutic properties of curcumin have also been considered to be associated with its antioxidant and anti-inflammatory properties. Because free-radical-mediated peroxidation of membrane lipids and oxidative damage of DNA and proteins are believed to be associated with a variety of chronic pathological complications such as cancer, atherosclerosis, and neurodegenerative diseases, curcumin is thought to play a vital role against these pathological conditions. The anti-inflammatory effect of curcumin is most likely mediated through its ability to inhibit cyclooxygenase-2 (COX-2), lipoxygenase (LOX), and inducible nitric oxide synthase (iNOS). COX-2, LOX, and iNOS are important enzymes that mediate inflammatory processes. Improper upregulation of COX-2 and/or iNOS has been associated with the pathophysiology of certain types of human cancer as well as inflammatory disorders. Because inflammation is closely linked to tumor promotion, curcumin with its potent anti-inflammatory property is anticipated to exert chemopreventive effects on carcinogenesis. Hence, the past few decades have witnessed intense research devoted to the antioxidant and anti-inflammatory properties of curcumin. In this review, we describe both antioxidant and anti-inflammatory properties of curcumin, the mode of action of curcumin, and its therapeutic usage against different pathological conditions. Turmeric, derived from the plant Curcuma longa, is a gold-colored spice commonly used in the Indian subcontinent, not only for health care but also for the preservation of food and as a yellow dye for textiles. Curcumin, which gives the yellow color to turmeric, was first isolated almost two centuries ago, and its structure as diferuloylmethane was determined in 1910. Since the time of Ayurveda (1900 Bc) numerous therapeutic activities have been assigned to turmeric for a wide variety of diseases and conditions, including those of the skin, pulmonary, and gastrointestinal systems, aches, pains, wounds, sprains, and liver disorders. Extensive research within the last half century has proven that most of these activities, once associated with turmeric, are due to curcumin. Curcumin has been shown to exhibit antioxidant, anti-inflammatory, antiviral, antibacterial, antifungal, and anticancer activities and thus has a potential against various malignant diseases, diabetes, allergies, arthritis, Alzheimer’s disease, and other chronic illnesses. These effects are mediated through the regulation of various transcription factors, growth factors, inflammatory cytokines, protein kinases, and other enzymes. Curcumin exhibits activities similar to recently discovered tumor necrosis factor blockers (e.g., HUMIRA, REMICADE, and ENBREL), a vascular endothelial cell growth factor blocker (e.g., AVASTIN), human epidermal growth factor receptor blockers (e.g., ERBITUX, ERLOTINIB, and GEFTINIB), and a HER2 blocker (e.g., HERCEPTIN). Considering the recent scientific bandwagon that multitargeted therapy is better than monotargeted therapy for most diseases, curcumin can be considered an ideal “Spice for Life”. Oxidative stress plays a key role in obesity and diabetes-related mitochondrial dysfunction. Mitochondrial dysfunction is characterized by increased oxidative damage, nitric oxide (NO) synthesis, and a reduced ratio of adenosine-5′-triphosphate (ATP) production/oxygen consumption. 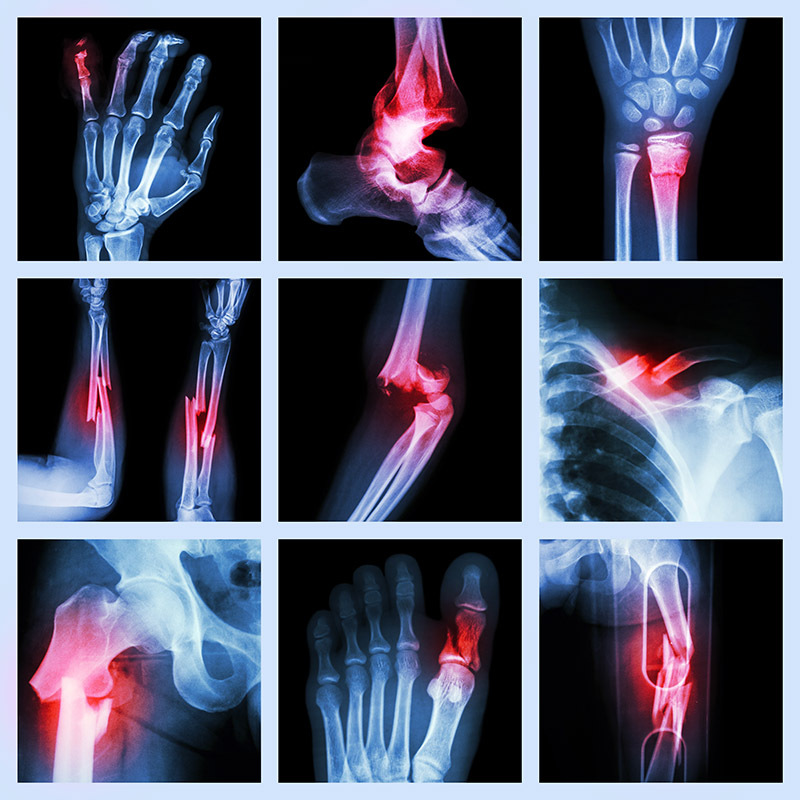 Curcumin represents a potential antioxidant and anti-inflammatory agent. In this study, our objective was to determine the effect of curcumin treatment on oxidative stress and mitochondrial dysfunction in high-fat diet (HFD)-induced obese mice (OM). These results suggest that curcumin treatment increased oxygen consumption and significantly decreased lipid and protein oxidation levels in liver mitochondria isolated from HFD-induced OM compared with those in the untreated OM (UOM). In kidney mitochondria, curcumin treatment significantly increased oxygen consumption and decreased lipid and protein peroxidation levels in HFD-induced OM when compared with those in UOM. Curcumin treatment neither has any effect on body weight gain nor have any effects on mitochondrial NO synthesis. These findings suggest that obesity induces oxidative stress and mitochondrial dysfunction, whereas curcumin may have a protective role against obesity-induced oxidative stress and mitochondrial dysfunction. Curcumin for radiation dermatitis: a randomized, double-blind, placebo-controlled clinical trial of thirty breast cancer patients. Radiation dermatitis occurs in approximately 95% of patients receiving radiotherapy (RT) for breast cancer. 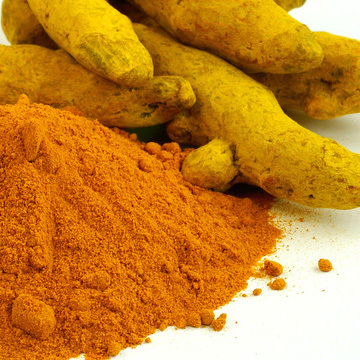 We conducted a randomized, double-blind, placebo-controlled clinical trial to assess the ability of curcumin to reduce radiation dermatitis severity in 30 breast cancer patients. Eligible patients were adult females with noninflammatory breast cancer or carcinoma in situ prescribed RT without concurrent chemotherapy. Randomized patients took 2.0 grams of curcumin or placebo orally three times per day (i.e., 6.0 grams daily) throughout their course of RT. Weekly assessments included Radiation Dermatitis Severity (RDS) score, presence of moist desquamation, redness measurement, McGill Pain Questionnaire-Short Form and Symptom Inventory questionnaire. The 30 evaluable patients were primarily white (90%) and had a mean age of 58.1 years. Standard pooled variances t test showed that curcumin reduced RDS at end of treatment compared to placebo (mean RDS = 2.6 vs. 3.4; P = 0.008). Fisher’s exact test revealed that fewer curcumin-treated patients had moist desquamation (28.6% vs. 87.5%; P = 0.002). No significant differences were observed between arms for demographics, compliance, radiation skin dose, redness, pain or symptoms. In conclusion, oral curcumin, 6.0 g daily during radiotherapy, reduced the severity of radiation dermatitis in breast cancer patients. BACKGROUND/AIMS: NF-E2-Related Factor-2 (Nrf2) is a transcription factor that plays a crucial role in the cellular protection against oxidative stress. Curcumin has been reported to induce Nrf2 nuclear translocation and upregulate the expression of numerous reactive oxygen species (ROS) detoxifying and antioxidant genes in hepatocytes.This study was designed to investigate whether curcumin-induced Nrf2 nuclear translocation could reduce ROS-mediated insulin resistance in cultured LO2 hepatocytes. METHODOLOGY: Human LO2 hepatocytes were incubated with curcumin and glucose oxidase (GO) in the presence/absence of wortmannin (a phosphatidyinositol 3-kinase (PI3K) inhibitor). Oxidative stress, cellular damage, Nrf2 nuclear translocation and insulin resistance were measured. RESULTS: GO exposure significantly increased intracellular ROS, glutathione (GSH) depletion, malondialdehyde (MDA) formation, and increased activities of cellular lactate dehydrogenase (LDH) and aspartate amino transferase (AST), as well as causing insulin resistance. Curcumin pretreatment significantly attenuated these disturbances in intracellular ROS, liver enzyme activity and significantly antagonized the lipid peroxidation, GSH depletion and insulin resistance induced by GO in LO2 hepatocytes. These effects paralleled Nrf2 nuclear translocation induced by curcumin. Wortmannin partially blocked curcumin-induced Nrf2 nuclear translocation. In addition, wortmannin prevented curcumin-induced improvements in intracellular ROS, MDA formation, GSH depletion, liver enzyme activity and insulin resistance in cultured LO2 hepatocytes. CONCLUSIONS: These findings suggest that curcumin could reduce ROS-mediated insulin resistance in hepatocytes, at least in part through nuclear translocation of Nrf2. Inhibition of carcinogenesis may be a consequence of attenuation of oxidative stress via activation of antioxidant defence system, restoration and stabilization of tumour suppressor proteins along with modulation of inflammatory mediators. Previously we have delineated a significant role of curcumin during its long-term effect in regulation of glycolytic pathway and angiogenesis, which in turn results in prevention of cancer via modulation of stress activated genes. The present study was designed to investigate long-term effects of curcumin in regulation of Nrf2 mediated phase-II antioxidant enzymes, tumour suppressor p53 and inflammation under oxidative tumour microenvironment in liver of T-cell lymphoma bearing mice. Inhibition of Nrf2 signalling observed during lymphoma progression, resulted in down regulation of phase II antioxidant enzymes, p53 as well as activation of inflammatory signals. Curcumin potentiated a significant increase in Nrf2 activation. It restored activity of phase-II antioxidant enzymes like GST, GR, NQO1, and tumour suppressor p53 level. In addition, curcumin modulated inflammation via upregulation of TGF-β and reciprocal regulation of iNOS and COX2. The study suggests that during long term effect, curcumin leads to prevention of cancer by inducing phase-II antioxidant enzymes via activation of Nrf2 signalling, restoration of tumour suppressor p53 and modulation of inflammatory mediators like iNOS and COX2 in liver of lymphoma bearing mice. The transcription factor Nrf2, which normally exists in an inactive state as a consequenceof binding to a cytoskeleton-associated protein Keap1, can be activated by redox-dependent stimuli. Alteration of the Nrf2/Keap1 interaction enables Nrf2 to translocate to the nucleus, bind to the antioxidant responsive element (ARE) and initiates the transcription of genes encoding for detoxifying enzymes and cytoprotective proteins. This response is also triggered by a class of electrophilic compounds including polyphenols and plant-derived constituents. Recently, the natural antioxidants curcumin and caffeic acid phenethyl ester (CAPE) have been identified as potent inducers of heme oxygenase-1 (HO-1), a redox-sensitive inducible protein that provides protection against various forms of stress. Here, we show that in renal epithelial cells both curcumin and CAPE stimulate the expression of Nrf2 in a concentration- and time-dependent manner. This effect was associated with a significant increase in HO-1 protein expression and hemeoxygenase activity. From several lines of investigation we also report that curcumin (and, by inference, CAPE) stimulates HO-1 gene activity by promoting inactivation of the Nrf2/Keap1 complex leading to increased Nrf2 binding to the resident HO-1 AREs. Moreover, using antibodies and specific inhibitors of the mitogen-activated protein kinase (MAPK) pathways, we provide data implicating p38 MAPK in curcumin-mediated HO-1 induction. Taken together, these results demonstrate that induction of HO-1 by curcumin and CAPE requires the activation of the Nrf2/ARE pathway. Influence of piperine on the pharmacokinetics of curcumin in animals and human volunteers. 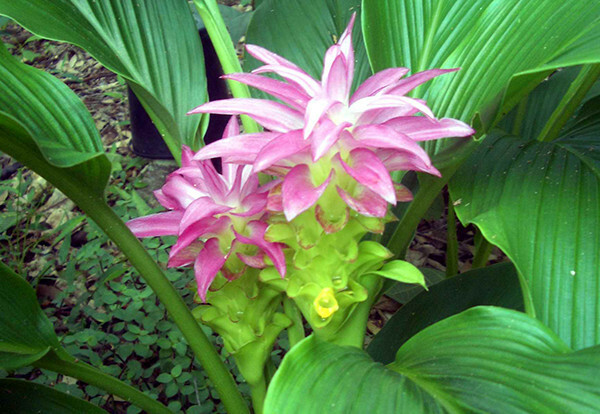 The medicinal properties of curcumin obtained from Curcuma longa L. cannot be utilised because of poor bioavailability due to its rapid metabolism in the liver and intestinal wall. In this study, the effect of combining piperine, a known inhibitor of hepatic and intestinal glucuronidation, was evaluated on the bioavailability of curcumin in rats and healthy human volunteers. When curcumin was given alone, in the dose 2 g/kg to rats, moderate serum concentrations were achieved over a period of 4 h. Concomitant administration of piperine 20 mg/kg increased the serum concentration of curcumin for a short period of 1-2 h post drug. Time to maximum was significantly increased (P < 0.02) while elimination half life and clearance significantly decreased (P < 0.02), and the bioavailability was increased by 154%. On the other hand in humans after a dose of 2 g curcumin alone, serum levels were either undetectable or very low. Concomitant administration of piperine 20 mg produced much higher concentrations from 0.25 to 1 h post drug (P < 0.01 at 0.25 and 0.5 h; P < 0.001 at 1 h), the increase in bioavailability was 2000%. The study shows that in the dosages used, piperine enhances the serum concentration, extent of absorption and bioavailability of curcumin in both rats and humans with no adverse effects. Curcuminoids are important polyphenols, antioxidants, and Nrf2 activators that help make Ultimate Protector an outstanding nutritional supplement.